If you have been following the local market in Malaysia, you would have notice a lack of direction in the KLCI recently. Moving sideways up and down can be quite frustrating for the average person. This sideways movement in the KLCI is really giving investors and traders a headache. What we are experiencing now is a volatility contraction which is often followed by volatility expansion. Take a look at the daily chart of KLCI above. The movements in recent weeks have been smaller and smaller helping to make the index form some kind of a triangle movement. 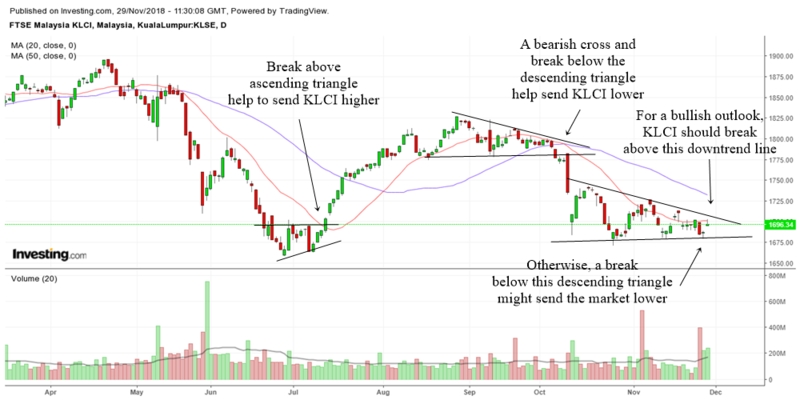 A look at it seems to tell investors that KLCI might be forming a descending triangle. As we all know a descending triangle could hint of a bearish continuation of the previous downward move. So far it has not broken down yet. The last time KLCI broke below a descending triangle, it caused a wave of selling in Malaysian stocks. This kind of environment can be difficult for investors. Perhaps staying on the sidelines while the patterns resolves itself might be a good strategy LOL. I myself and so many other traders have learnt that its best to take trades only when many criterias have a tick on it. Well, in a difficult environment its best to stay on the cautious side. Sometimes the rules help us to stay on the right side of the trend.